All you need in this life is ignorance and confidence, and then success is sure, Mark Twain, American philosopher. Beijing skyline, Thursday morning, St. Patrick’s Day, 2016. This picture was taken on the second ring of the Chinese Capital on the way to a meeting about 8:30 in the morning. The AQI (air quality index) is about 400, and the visibility is a few hundred yards at best….photo taken a few hours after a run in this air. Click on any figure to get a large image. One of the joys in my life is to “experience” the places I visit with a run — usually hoping to sample the geology, although I am delighted to be able to sample the human culture with my slow sorties of 5 to 6 miles an hour. I don’t run much on city streets, but when I visit a new place I always plan a run to one of the iconic features of the city. 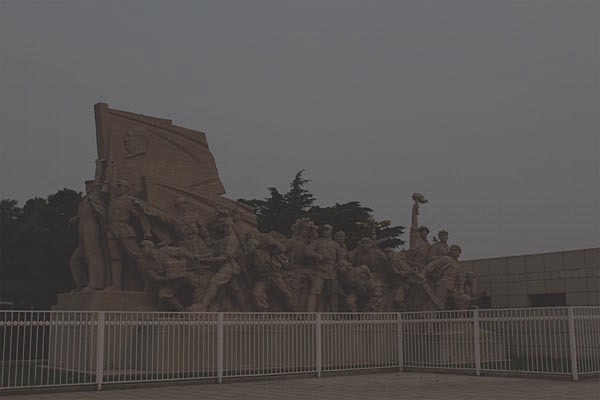 I visited Beijing for work in March, and despite admonishments about running in the Chinese capital, I planned for a 5+ mile run to and around Tiananmen Square. 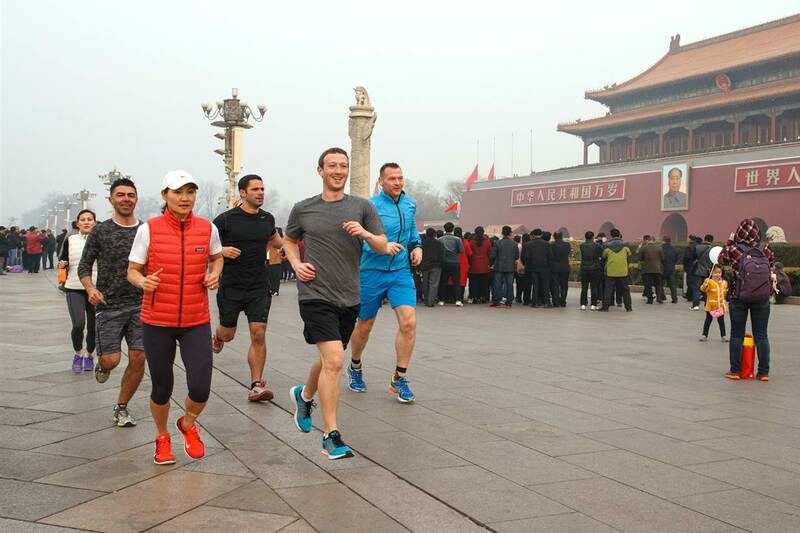 Mark Zuckerberg running in Tiananmen Square hours after me – if only I had known, I could have run with Facebook (banned in China, btw). Note the air quality. Also, note Zuckerberg’s feet – something is odd about how he floats across the paving stone. Tiananmen Square is one of the largest city plazas in the world; the square covers more than 100 acres, and is surrounded by, or encloses, some of the most famous fixtures of Beijing. The square is framed by the Tiananmen Gate (roughly translates to “The Gate of Heavenly Peace”) in the north, The Great Hall of the People on the West, the Mao Zedong Memorial Hall on the south (inside this museum is the embalmed body of Mao resting in a clear coffin), and the National Museum of China on the east. There is so much history within the Square especially with respect to the founding of the People’s Republic of China: Mao gave a speech from Tiananmen Gate proclaiming the People’s Republic of China in 1949 (and, of course, the PRC quashed uprising democratic uprising in the Square 50 years later), and in the center of the Square is Monument to the People’s Heroes, a tall tower honoring those that gave their lives to found the Republic. Given my limited time for anything other than work on my trip to China, it was obvious that my run had to be to Tiananmen Square. However, I also knew that I would have to run early in the morning – before the sun would rise – and thus, had to plan my trip with more care than usual. I checked the US Embassy website that broadcasts information about air quality, and although the prediction for the day I could run was “not great”, it seemed that short trot would be tolerable…..
Beijing is a true megacity – it has a population about 21.5 million people and a huge transient workforce that might push the total populous to greater than 25 million on a given day. Beijing does not have the largest population of a metro area in China; both Chongqing and Shanghai have larger metro-populations. However, Beijing is the center of power in China, and it’s gravitational pull is great. In 1990 Beijing had less than 11 million people, and in the ensuing 25 years this population doubled. I visited Beijing in 1990 as a member of a USGS delegation celebrating Sino-American cooperation in seismology. At the time I was struck by the size of city, but also by the less-than first world nature of the infrastructure. There were high rises, but Soviet style squat grey concrete architecture ruled the viewscape. Roads were choked bicycles – all riding in a style that seemed chaotic, but somehow worked. Today there are brilliant high rise buildings with wonderful and unique architecture, and bikes are much rarer. The streets – and there are many, many more multilane hiways – are filled with cars (Audi, BMW, Lexus, are common), all looking pretty new (I guess considering that the population is “new” to Beijing, the cars should be new also). However, the new buildings and infrastructure of Beijing did not replace the old Beijing, it just built around it. This is particularly true of the hutong, the traditional alley like streets that run every direction only a few yards from the multi-lane hiways. To me, it is this contrast of dynastic China and superpower China that best captures Beijing. 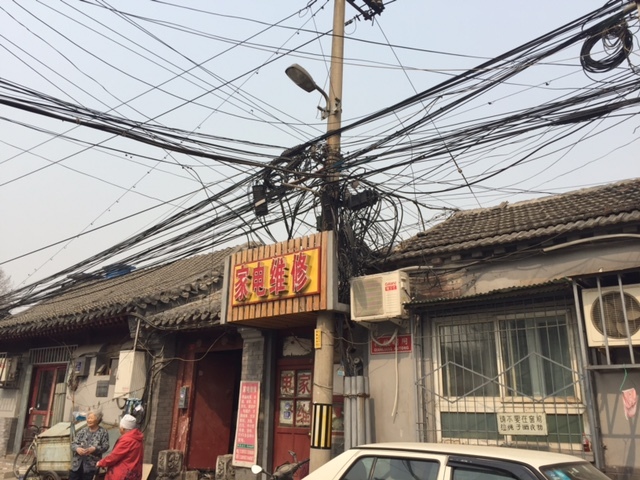 The electrical grid in a hutong near the JW Marriott Central Beijing. This single photograph explains the infrastructure of Beijing. Masses of wires, random coils, and even some dangling, unattached cable. Beijing sits at the northern apex of a large triangular-shaped geomorphic feature called the Northern China Plain (NCP). 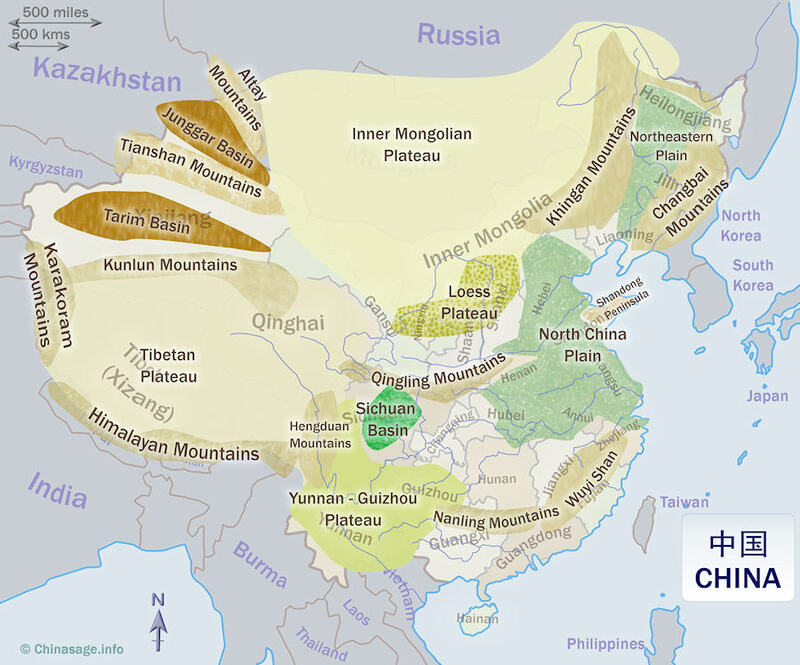 The NCP is really a large alluvial fan that was deposited as the Huang He River (sometimes called the “Yellow river”) meandered through history. The resulting plain is indeed “plain” – it is flat, all the geology is covered! The soil is fertile, which means that agriculture was important, especially before the rise of the supercity. When Mao established Beijing as the capital of the PRC, it had a population of about 2 million. It began to grow rapidly after that time, but projects to build infrastructure kept some sense of pace. However, after 1990 and the growth rates of doubling in less that 25 years, the human push far outstripped the ability to accommodate a leisurely infrastructure construction rate. Further, the dramatic growth in the Chinese GDP over the same time meant money – for cars. Cars, plus the demand for energy, lead to one of most rapid increase in carbon based fuel use in a geographic area ever observed. Today, Beijing is a bustling center – and home to some of the worst air quality anywhere in the world. The most common way to measure air quality is with a composite index called the “Air Quality Index” or AQI. There are slight variations from country to country, but the heart of all AQI measurements are the quantitative assessment of 5 or 6 pollutants averaged over a specific period of time (usually a day). In China the AQI is based on SO2, NO2, CO2, O3, and suspended, or aerodynamic, particles of two sizes (diameters smaller than 10 microns, and smaller than 2.5 microns). The AQI score is based on a formula that converts these pollutants to a number between 0 and 500 (the original intent was that the top of the scale could not be reached). It is a very non-linear scale; air that has an AQI of 100 is not twice as bad as air with an AQI of 50. In Beijing nearly the only pollutant that is important is the smallest scale suspended particles, known as PM2.5. These are tiny particles are particularly harmful to humans because we have no filtration system to stop them from entering the deepest part of the lungs and there these particles can be absorbed into the blood stream. 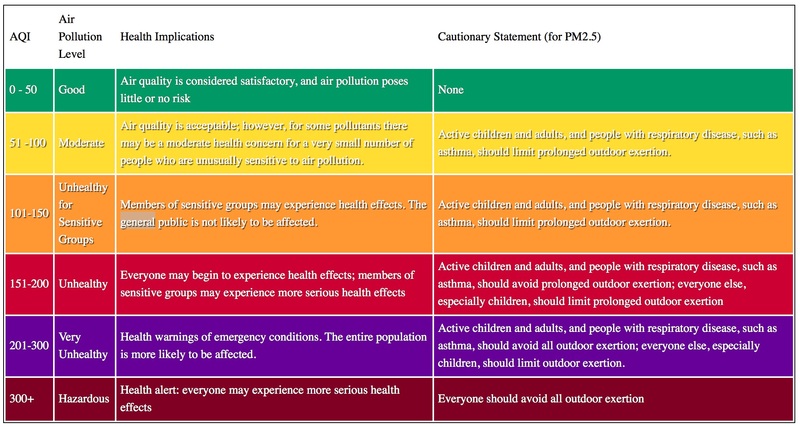 AQI, or Air Quality Index, and the international standards for quality of air. Excellent quality air has AQI scores of 0-50, and must have a suspended load of PM2.5 that is less than 12 micrograms per cubic meter (12 micrograms per 1000 liters of air). This is pretty typical of the air in Los Alamos, my home. There are many days with the measured average of PM2.5 is less an 3 micrograms per cubic meter. Unhealthy air registers an AQI of 151-200, which means that the PM2.5 load is less than 150 micrograms per cubic meter. The scale originally envisioned that an AQI of 500 was unattainable because it was so polluted — this would correspond to a PM2.5 of 500 micrograms/m**3. However, in the last 2 years there have been observations in Beijing where in excess of 800 micrograms/m**3 were measured! The composition of PM 2.5 in Beijing. 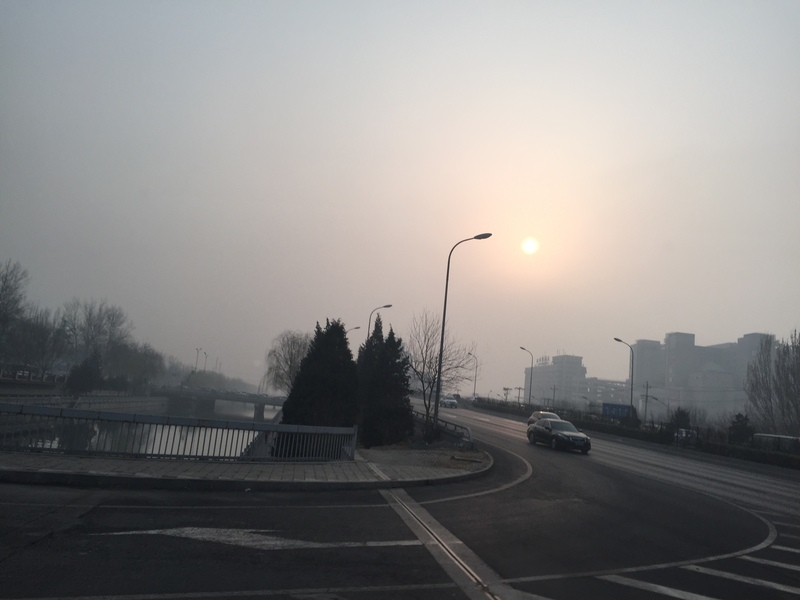 The annual average “load” for the air in Beijing is about 120 micrograms of very fine material (PM 2.5, or suspended particles with diameters less that 2.5 micrometers). Then majority of the material is carbon and chemical byproducts of burning coal and gasoline. The PM2.5 particles are very tiny — about 30 times smaller than the width of a human hair. They are quite dangerous because humans evolved without a defense mechanism – ancient man was mostly worried about dust, with is a much larger particle. The PM 2.5 are inhaled deeply into the respiratory tract, reaching the deepest recesses of the lungs. These particles cause short-term health effects due to destruction of lung tissue, and can irritate the eyes, nose, and throat. There are many studies on how PM 2.5 decreases lung function, but few studies on the effects from short time exposure. 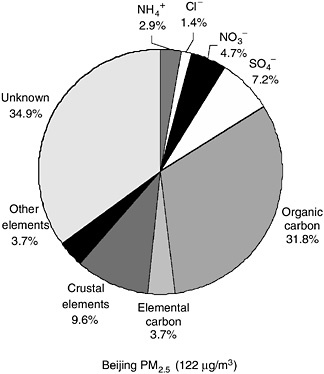 The dominate source of PM 2.5 particles is from automobile exhaust and other operations that involve the burning of fuels – in particular coal. In Beijing, automobiles plus coal power plants account for 75% of the PM2.5 particles. When I was in Beijing in March (2016) there was a period where the AQI reached 460 – unbelievably bad air. The visibility was hundreds of feet, and eyes water freely — for everyone. I planned to run to Tiananmen Square early in the morning on St. Patrick’s day. The air was predicted to be bad, but I figured (see the Mark Twain quote at the top of this article) the run would be short. If I had actually done the calculation on ingested PM 2.5 I would never have run – but ignorance is bless (and ill). The AQI for a measuring station near Tiananmen Square. My run began on Thursday at about 5 am – which can be seen to have an AQI of about 282. BAD air. I had planned out a route to travel through the hutong to Tiananmen that would be about 2 miles. I awake at 4 am (14 hours difference in time between Los Alamos and Beijing – jet lag is inappropriate to describe the effects of this time shift!). I checked the temperature outside, and it was cool – seemed like great running weather. I exited the hotel and immediately noticed that the air looked foggy, but it was dry as a bone. I ran a slow place and took it the sites (although it was dark! no street lights). In hindsight the route was not that well thought out – it was not like I could actually read the few street signs that were present. It took me 2.4 miles before I even spied Tiananmen. When I arrived at the square I was coughing a bit, but I interpreted this as lingering colds from travel. The air was eery – a obscured skyline, and the feeling that it was closing in on me like a Stephen King novel. I only took one picture (the image above), and that was of the Worker’s Statue. The low level light and smog was certainly not ideal for iPhone pictures; I was also a bit nervous about being a “suspicious character”. I took a more direct route back to the hotel. I was struck by the wide hiways that had zero traffic on them at 5:30 in the morning knowing that in only 2 hours the traffic would be bumper to bumper. I seems a staggered work day could solve at least some of the infrastructure issues. As I approached the hotel I was coughing frequently, and now it dawned on me that this really was a smog issue. I checked the AQI for the area around Tiananmen Square, and found that the reading were now above 300 – which translates into a PM 2.5 load of about 250 micrograms/m**3. The amount of air breathed per time for running: for then average 150 pound man, 60 liters are circulated in the lungs when running 5 miles/hr. I pondered what the impact of breathing in these micro particles would really be – was it temporary, or more correctly, how temporary? Deep in the lungs — in the alveoli, where the lungs perform the gas-exchange function — there are two distinct types of cells. These cells are fragile, but also regenerate on a regular basis because of the fragility. Much work has been done on the rates of regeneration, mostly because of research on health benefits of cessation of smoking. The rate of regeneration is on the order of weeks for localized areas, and the entire lung will be regenerated within the time frame of a year or two. That was somewhat comforting, but I wanted to know exactly what damage I may have done with the run so I reasoned that it was based on the total PM 2.5 load I inhaled. For an average male running 5 miles/hr about 60 liters of air is consumed per minute; my run as on the order of an hour, thus approximately 4000 liters of air was consumed. I took the PM 2.5 load to be 250 micrograms per 1000 liters, and arrived at a total ingestion of 1000 micrograms of carbon crap. Not pretty, but really quite modest in the scheme of things (if it was lead I would have been quite worried!) – I was confident that I would recover in hours, or days at worse. Dilbert cartoon — humm, this appeared in the Dilbert Calendar for this year on March 17th! Same day as I ran….coincidence? My confidence was shaken a few hours later when I had a sever coughing fit and small amounts of blood were in my phlegm. Realistically, small amounts of bloody phlegm is a benign sign of bronchitis, and testament to extreme irritation. However, I was both surprised and a bit shaken by the sight of blood! But it passed within a few hours, although the coughing fits persisted for several days. I would not repeat this experiment of running in smog! But, as time has passed, it is just another interesting running experience – not unlike falling down a mountain during a trail run, or make poor decision to plow through black thorn on an overgrown trail. Granitic Gneiss in front of the new National Nuclear Security Center. The lack of geology around Beijing is definitely a bummer — no rocks to tell the story of why Beijing is there, or what the area must have looked like in the distant past. However, I was very pleasantly surprised to find some spectacular rocks on display at the State Nuclear Security Technical Center. Feng shui is an important philosophical value of harmonizing man with the surrounding environment. 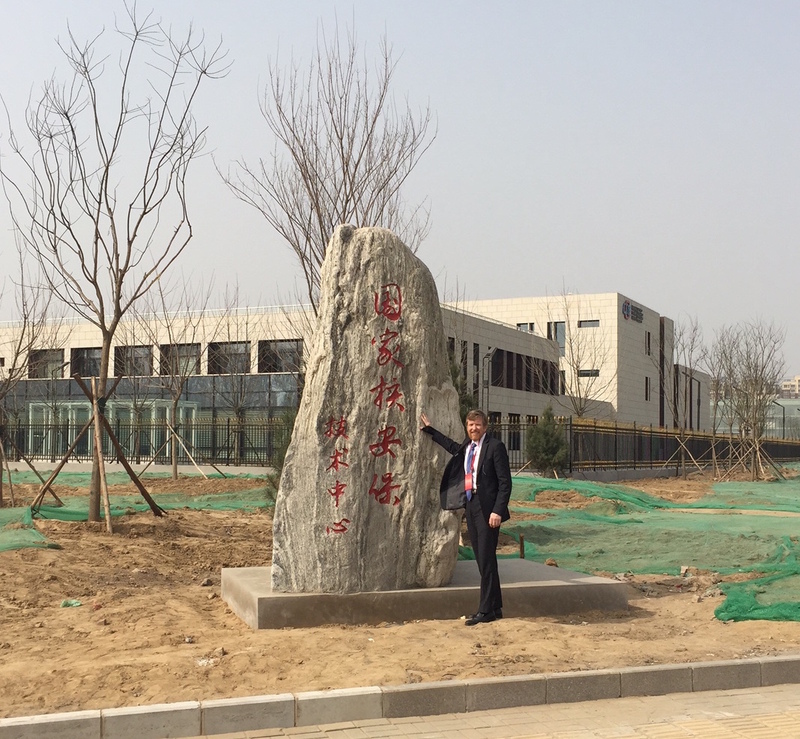 At the dedication of the new state center for nuclear security the Chinese had brought in several large rocks to achieve Feng shui; these rocks were trucked in from the most sacred mountain in all China. Called the Eastern Mountain, or Mt. Tai, which is located about 150 km south of Beijing in Shandong province. Mt Tai is associated with the rising sun and thus, birth and renewal. In the picture above I am standing in front of one of these rocks – to me it is a great example of granitic gneiss with bright streaks of biotite. However, since the rock is also about renewal, I celebrate the recovery of my lungs!